Observe heat transfer and change in temperature and mass. Calculate final temperature after heat transfer between two objects. One of the major effects of heat transfer is temperature change: heating increases the temperature while cooling decreases it. We assume that there is no phase change and that no work is done on or by the system. Experiments show that the transferred heat depends on three factors—the change in temperature, the mass of the system, and the substance and phase of the substance. Figure 1. The heat Q transferred to cause a temperature change depends on the magnitude of the temperature change, the mass of the system, and the substance and phase involved. (a) The amount of heat transferred is directly proportional to the temperature change. To double the temperature change of a mass m, you need to add twice the heat. (b) The amount of heat transferred is also directly proportional to the mass. To cause an equivalent temperature change in a doubled mass, you need to add twice the heat. (c) The amount of heat transferred depends on the substance and its phase. 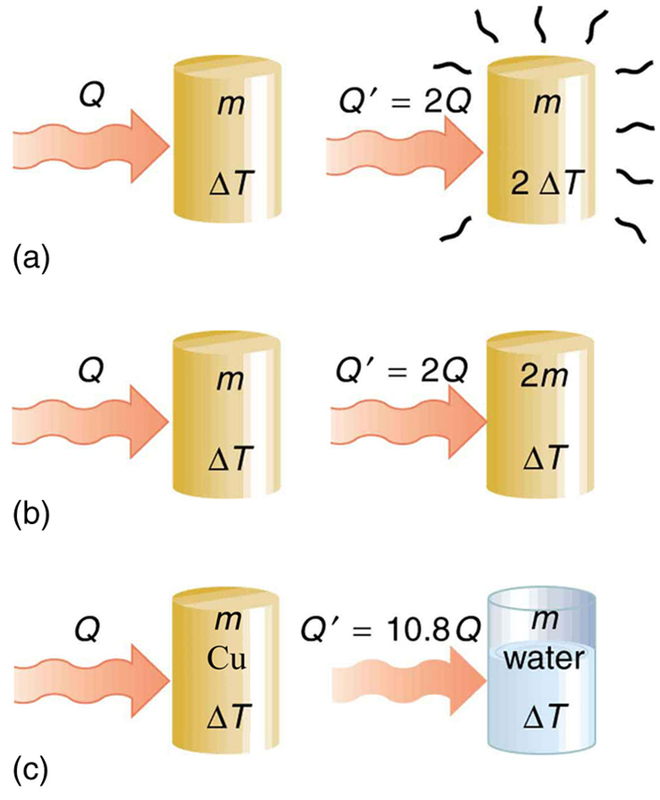 If it takes an amount Q of heat to cause a temperature change ΔT in a given mass of copper, it will take 10.8 times that amount of heat to cause the equivalent temperature change in the same mass of water assuming no phase change in either substance. The dependence on temperature change and mass are easily understood. Owing to the fact that the (average) kinetic energy of an atom or molecule is proportional to the absolute temperature, the internal energy of a system is proportional to the absolute temperature and the number of atoms or molecules. Owing to the fact that the transferred heat is equal to the change in the internal energy, the heat is proportional to the mass of the substance and the temperature change. The transferred heat also depends on the substance so that, for example, the heat necessary to raise the temperature is less for alcohol than for water. For the same substance, the transferred heat also depends on the phase (gas, liquid, or solid). Values of specific heat must generally be looked up in tables, because there is no simple way to calculate them. In general, the specific heat also depends on the temperature. Table 1 lists representative values of specific heat for various substances. Except for gases, the temperature and volume dependence of the specific heat of most substances is weak. We see from this table that the specific heat of water is five times that of glass and ten times that of iron, which means that it takes five times as much heat to raise the temperature of water the same amount as for glass and ten times as much heat to raise the temperature of water as for iron. In fact, water has one of the largest specific heats of any material, which is important for sustaining life on Earth. A 0.500 kg aluminum pan on a stove is used to heat 0.250 liters of water from to (a) How much heat is required? What percentage of the heat is used to raise the temperature of (b) the pan and (c) the water? The pan and the water are always at the same temperature. When you put the pan on the stove, the temperature of the water and the pan is increased by the same amount. We use the equation for the heat transfer for the given temperature change and mass of water and aluminum. The specific heat values for water and aluminum are given in Table 1. Because water is in thermal contact with the aluminum, the pan and the water are at the same temperature. In this example, the heat transferred to the container is a significant fraction of the total transferred heat. Although the mass of the pan is twice that of the water, the specific heat of water is over four times greater than that of aluminum. Therefore, it takes a bit more than twice the heat to achieve the given temperature change for the water as compared to the aluminum pan. Figure 2. The smoking brakes on this truck are a visible evidence of the mechanical equivalent of heat. Truck brakes used to control speed on a downhill run do work, converting gravitational potential energy into increased internal energy (higher temperature) of the brake material. This conversion prevents the gravitational potential energy from being converted into kinetic energy of the truck. The problem is that the mass of the truck is large compared with that of the brake material absorbing the energy, and the temperature increase may occur too fast for sufficient heat to transfer from the brakes to the environment. Calculate the temperature increase of 100 kg of brake material with an average specific heat of if the material retains 10% of the energy from a 10,000-kg truck descending 75.0 m (in vertical displacement) at a constant speed. If the brakes are not applied, gravitational potential energy is converted into kinetic energy. When brakes are applied, gravitational potential energy is converted into internal energy of the brake material. We first calculate the gravitational potential energy that the entire truck loses in its descent and then find the temperature increase produced in the brake material alone. This temperature is close to the boiling point of water. 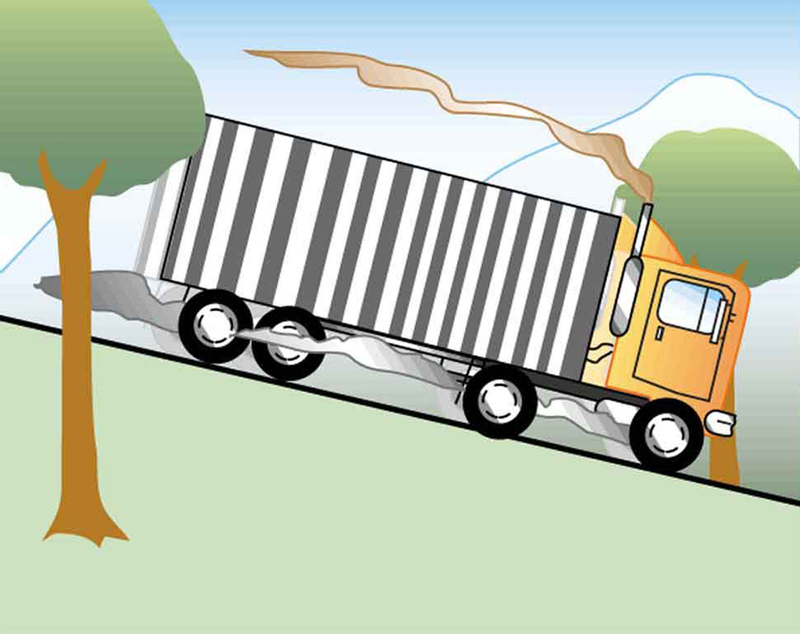 If the truck had been traveling for some time, then just before the descent, the brake temperature would likely be higher than the ambient temperature. The temperature increase in the descent would likely raise the temperature of the brake material above the boiling point of water, so this technique is not practical. However, the same idea underlies the recent hybrid technology of cars, where mechanical energy (gravitational potential energy) is converted by the brakes into electrical energy (battery). Note that Example 2 is an illustration of the mechanical equivalent of heat. Alternatively, the temperature increase could be produced by a blow torch instead of mechanically. Suppose you pour 0.250 kg of water (about a cup) into a 0.500-kg aluminum pan off the stove with a temperature of Assume that the pan is placed on an insulated pad and that a negligible amount of water boils off. What is the temperature when the water and pan reach thermal equilibrium a short time later? This is a typical calorimetry problem—two bodies at different temperatures are brought in contact with each other and exchange heat until a common temperature is reached. Why is the final temperature so much closer to than The reason is that water has a greater specific heat than most common substances and thus undergoes a small temperature change for a given heat transfer. A large body of water, such as a lake, requires a large amount of heat to increase its temperature appreciably. This explains why the temperature of a lake stays relatively constant during a day even when the temperature change of the air is large. However, the water temperature does change over longer times (e.g., summer to winter). What heats faster, land or water? Heat both (using an oven or a heat lamp) for the same amount of time. Record the final temperature of the two masses. Now bring both jars to the same temperature by heating for a longer period of time. Remove the jars from the heat source and measure their temperature every 5 minutes for about 30 minutes. Which sample cools off the fastest? This activity replicates the phenomena responsible for land breezes and sea breezes. The transfer of heat that leads to a change in the temperature of a body with mass is where is the specific heat of the material. This relationship can also be considered as the definition of specific heat. 1: What three factors affect the heat transfer that is necessary to change an object’s temperature? 2: The brakes in a car increase in temperature by when bringing the car to rest from a speed How much greater would be if the car initially had twice the speed? You may assume the car to stop sufficiently fast so that no heat transfers out of the brakes. 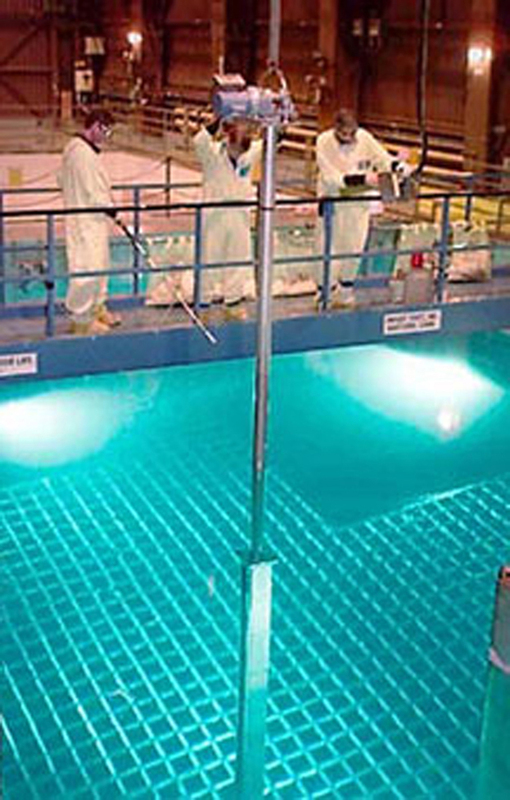 1: On a hot day, the temperature of an 80,000-L swimming pool increases by What is the net heat transfer during this heating? Ignore any complications, such as loss of water by evaporation. 3: To sterilize a 50.0-g glass baby bottle, we must raise its temperature from to How much heat transfer is required? 4: The same heat transfer into identical masses of different substances produces different temperature changes. Calculate the final temperature when 1.00 kcal of heat transfers into 1.00 kg of the following, originally at (a) water; (b) concrete; (c) steel; and (d) mercury. 5: Rubbing your hands together warms them by converting work into thermal energy. If a woman rubs her hands back and forth for a total of 20 rubs, at a distance of 7.50 cm per rub, and with an average frictional force of 40.0 N, what is the temperature increase? The mass of tissues warmed is only 0.100 kg, mostly in the palms and fingers. 6: A 0.250-kg block of a pure material is heated from to by the addition of 4.35 kJ of energy. Calculate its specific heat and identify the substance of which it is most likely composed. 7: Suppose identical amounts of heat transfer into different masses of copper and water, causing identical changes in temperature. What is the ratio of the mass of copper to water? 8: (a) The number of kilocalories in food is determined by calorimetry techniques in which the food is burned and the amount of heat transfer is measured. How many kilocalories per gram are there in a 5.00-g peanut if the energy from burning it is transferred to 0.500 kg of water held in a 0.100-kg aluminum cup, causing a temperature increase? (b) Compare your answer to labeling information found on a package of peanuts and comment on whether the values are consistent. 9: Following vigorous exercise, the body temperature of an 80.0-kg person is At what rate in watts must the person transfer thermal energy to reduce the the body temperature to in 30.0 min, assuming the body continues to produce energy at the rate of 150 W? 1 The values for solids and liquids are at constant volume and at except as noted. 3 at constant volume and at except as noted, and at 1.00 atm average pressure. Values in parentheses are at a constant pressure of 1.00 atm. 1: The heat transfer depends only on the temperature difference. Since the temperature differences are the same in both cases, the same 25 kJ is necessary in the second case. 14.2 Temperature Change and Heat Capacity by OpenStax is licensed under a Creative Commons Attribution 4.0 International License, except where otherwise noted.